A holding device used for cameras, light fixtures, optical devices, and other applications. Steel ball magnetically held in spherical socket. The steel ball is subject to a magnetic field in the permanent magnetic system and is thus held in the spherical socket by this magnetic force. It permits the ball a full 360° rotation on a 180° axis. You can freely orient your equipment to an infinite number of positions within this rotation. If the holding force of the magnet system is exceeded, the ball is released without damage. Magnetic base threaded(M3, M4, M5). 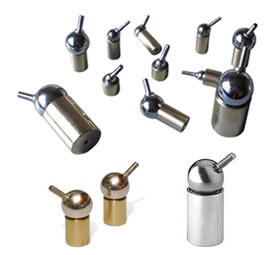 Steel ball magnetically held in spherical socket The steel ball is subject to a magnetic field in the permanent magnetic system and is thus held in the spherical socket by this magnetic force. This results in a joint which can be turned in any direction with an angle up to 180°. If the holding force of the magnet system is exceeded, the ball is released without damage. All-round galvanic plating units with max. operating temperature of 200 °C.